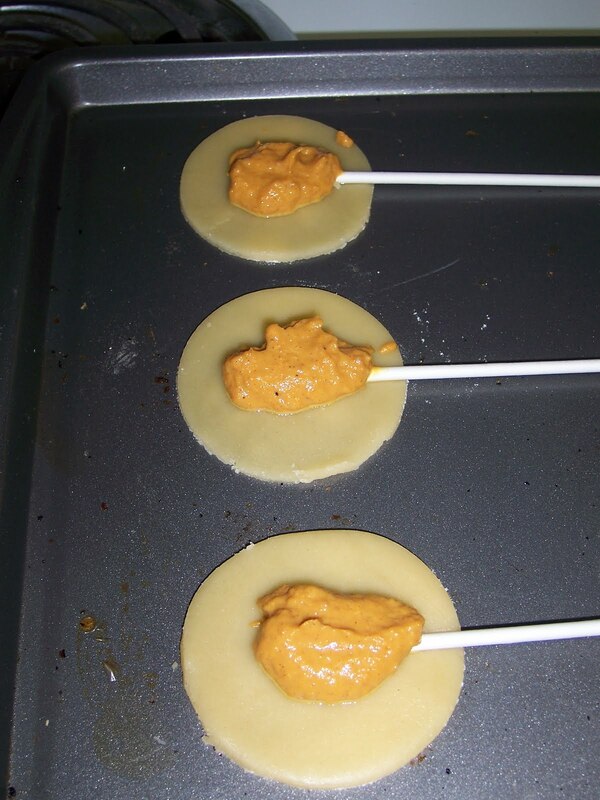 Easy as pie: the pictures: part one: pie pops. 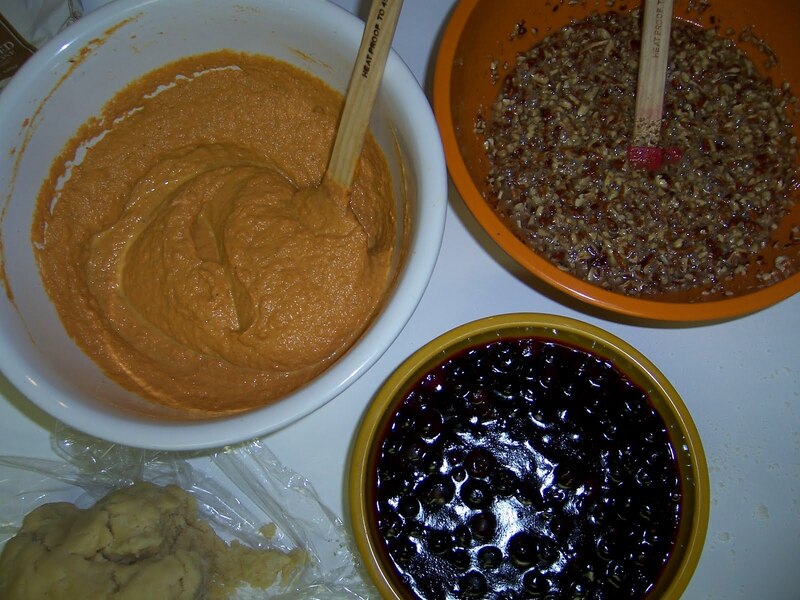 the three fillings: pumpkin, pecan, and blueberry, and a little chunk of the cookie dough. next, pecan. look at how gooey they are! baked blueberry pie pops! a little bit messy, but still really yummy! a bunch of baked pie pops! Last night, with the help of my assistant pastry chef (Benjie), I finally had a chance to make pie pops. Although fun to make, it is a long process, especially if you are like us, and like to make things from scratch. You could do things the more convenient way, and buy pre-made dough, and pre-made pie filling, and then just put all of the ingredients together, but where’s the adventure in that? So, first came the dough. The other blogs that we found the pie pops on used traditional pie crust, but I wanted to try something different, so I made a dough that is similar to cookie dough. In fact, the recipe I used is from the Culinary Institute of America‘s book, Baking and Pastry: Mastering the Art and Craft, called 1-2-3 cookie dough. You may be thinking it is called that because it is easy as 1-2-3, which is true, but it is really called that because the recipe’s formula is a 1 to 2 to 3 ratio of butter, sugar, and flour. (ex: 1lb butter, 2lbs of sugar, and 3lbs of flour, with the addition of eggs (4) and flavorings.) I also used pie dough, just to see and taste the difference. The cookie dough recipe is similar to the CIA’s recipe for traditional pie dough, which they conveniently call, 3-2-1 pie dough. (3 parts flour, 2 parts butter, 1 part water.) I will share all recipes used at the end of this post. All of the recipes I used were really easy, mostly containing steps basically including “put all ingredients in bowl and mix together”. As far as textures go, the cookie crust was crunchier, and the pie dough was flakier, but both were good. I also liked the look of the cookie dough pops better, they came out shiner and just all-around nicer-looking. Next, we made the fillings! We tried three different pie fillings, blueberry, pecan, and pumpkin. While it was fun to have all of the different flavors in the end, next time we are going to stick with one flavor. 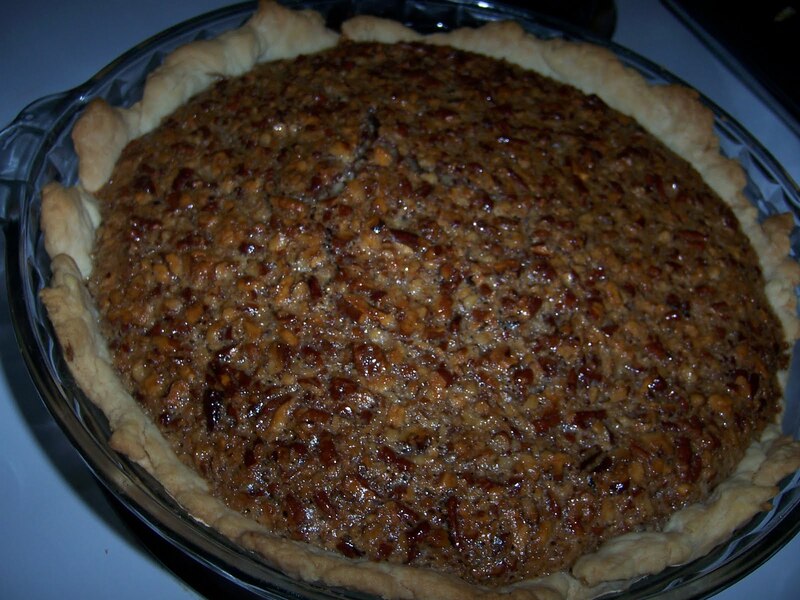 This is for simplicity, and because you do not use a lot of filling for each pop, we ended up making a full pecan pie, a blueberry cookie crumble, and have the left over pumpkin pie filling waiting it’s turn to be made into a full-sized pie in the freezer. So much pie! I think the pops made with the cookie crust were the best, because you can add more filling, and the ratio of crust to filling was perfect, compared to the pie dough, which left little room for filling, and therefore, the high ratio of crust to filling was not good.The fillings were all good, my favorite was the blueberry, not to sweet, not too tart. The pumpkin filling was okay, but would be better with real pumpkin, and not canned. (Yes,we used some convenience items. Perhaps later, when pumpkins, and other squash items are in season, I will make pumpkin pie from real pumpkin.) The pecan filling was gooey, and tasted good, but since it was the runniest, it created the flattest pops. I am happy to have used the rest of that filling for its own full-sized pie (made with leftover pie dough). Yum! 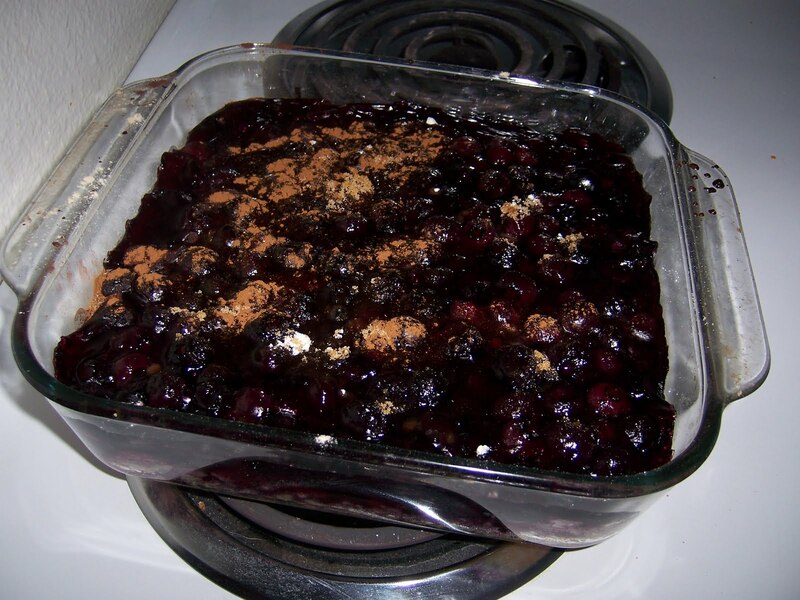 I have not tried the blueberry cookie crumble, which was leftover cookie dough, left over blueberry filling, sprinkled with brown sugar, a little bit of flour, and cinnamon. I am sure it is good, though. Okay, time for recipes! The filling recipes all came from the wonderful internet and the dough recipes came from the CIA’s Baking and Pastry book, as previously mentioned. 1-2-3 cookie dough: I scaled down the recipe to yield about 3 pounds of dough. This may sound like a lot of dough, but it gets used quickly. If you do have leftover dough, you could make a crumble, like I did, or refrigerate or freeze for later use. This makes really great tart dough, for those of you who like fresh fruit tarts. Cream together butter and sugar. Add the eggs, one at a time. Slowly incorporate all of the flour. Be sure not to over mix, just be sure that all of the ingredients are combined. Cover, and chill until cool to the touch. Use plenty of flour underneath dough when rolling it out. However, too much flour will prevent it from sticking together. 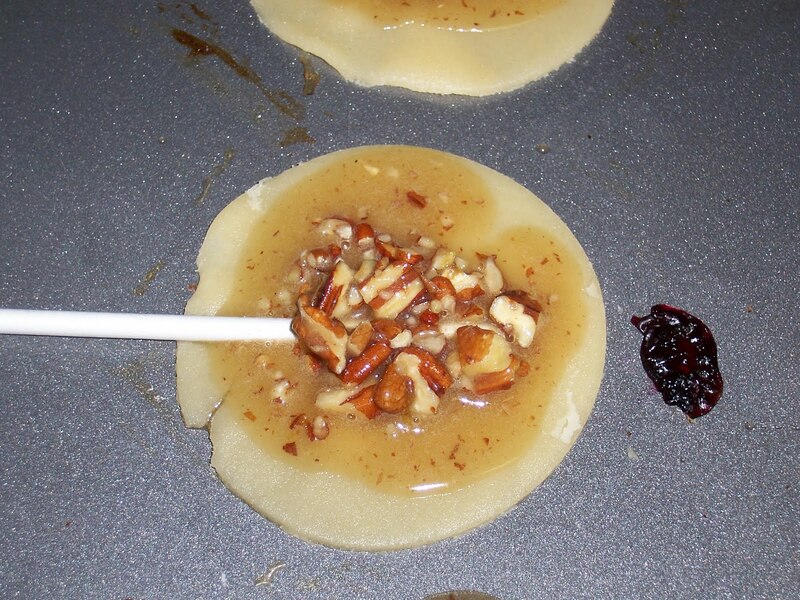 If using for pie pops, you should be able to roll out pressed together scraps 2-3 times. Although I like the recipe for 3-2-1 pie dough, from the CIA, I did use this one, which follows the same recipe formula, but is easier to measure for those Suzy-homemakers out there with out the convenience of a kitchen scale. This makes enough for a bunch of pops, or one 9″ pie crust. This can also be refrigerated or frozen for later use. Place flour in a bowl. Cut butter into small pieces, about pea-size, and place in bowl. Toss around butter pieces, to be sure they are all completely covered in flour. Start to press dough together. This will help determine how much water should be used. My dough was coming together nicely, so I started out by adding only 1/4 cup of water. Then I pressed the dough together, and added just enough water to form a soft, smooth dough. 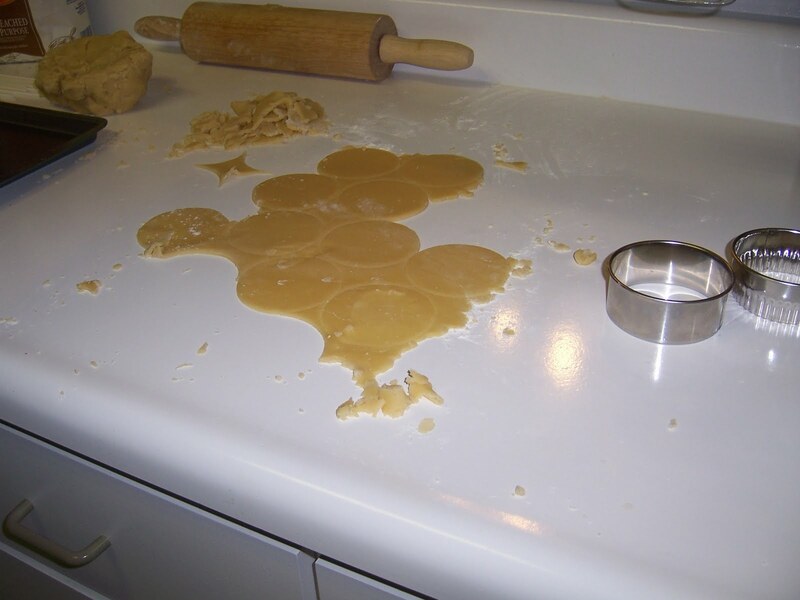 I was able to keep pressing together all of the scraps of dough and adding some dough that had not been rolled out yet, which allowed me to re-roll numerous times. 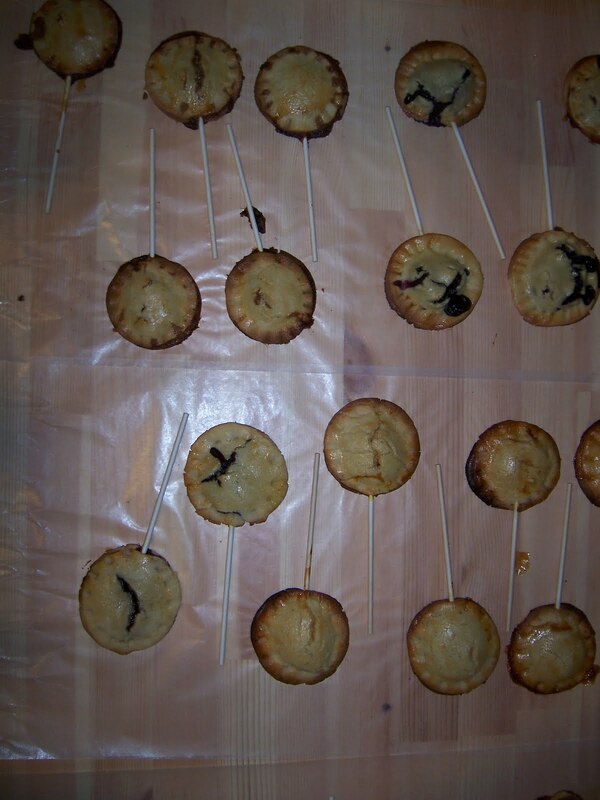 We followed the instructions on Bakerella‘s site on how to make the pie pops. Despite all of the work to be done for the dough and the fillings, the actual assembly is pretty easy. 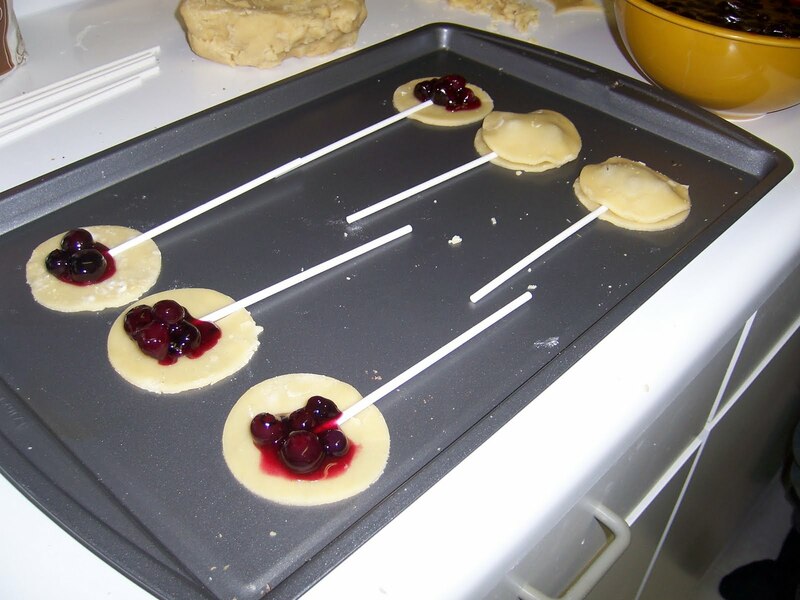 Basically, cut out the circles of dough, place them on the cookie sheet, press on lollipop sticks (found at a craft store), place on a spoonful of filling, place another circle of dough on top, use another stick to help press down the top layer of dough, brush tops with egg white, bake in 375-degree oven for about 10-14 minutes. Let cool, and enjoy! Okay, I am currently having trouble uploading the pictures, so you will have to use your imagination for now, and I will try to upload them soon! The desserts consumed over the weekend all involved chocolate in some way. Not very surprising, because I am somewhat of a choco-holic. I went to Fish and Farm Friday night, and I had the wonderful Chocolate Peanut Butter Mousse. This was served with chocolate ice cream and caramel-as a sauce on the plate, and a piece of caramel with salt (like a piece of brittle), that I consumed at the very end. I love the salty-sweet combo of peanut butter and chocolate. The mousse was rich, but not overwhelming. I am not sure that the ice cream was a necessary addition to the dessert, but nonetheless, it was good, and chocolaty, and therefore fully consumed by me. The next day, I was going to attempt the pie pops, as previously mentioned, but lollipop sticks are nowhere to be found in San Francisco, so I made the “better than brownie cookies” as presented on the Technicolor Kitchen blog. These are great cookies and certainly live up to their name. Texture-wise, I tend to like fudge-y brownies, rather than cake-y brownies, and these cookies were somewhere inbetween. 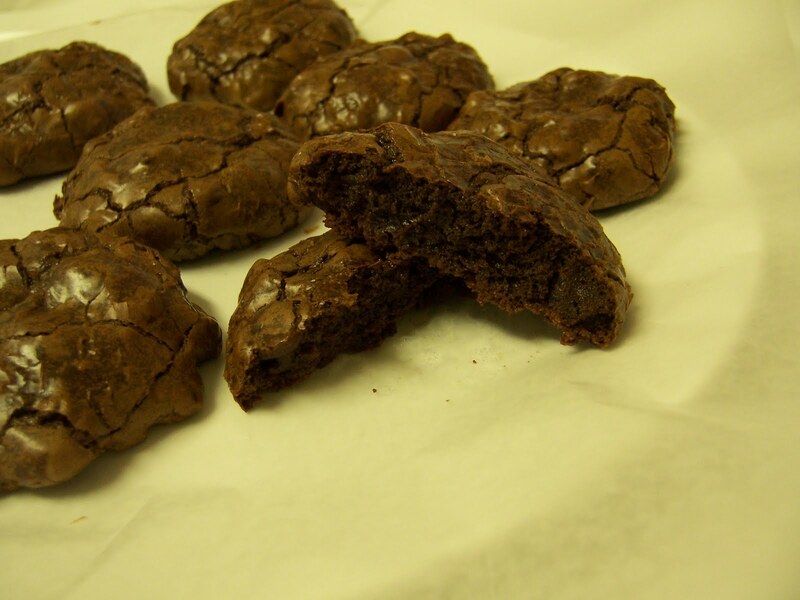 However, these cookies are similar to brownies because they have a crusty outer layer. I like this texture contrast. Also, I do not like the edges of brownies (I like the pieces from the middle of the pan.) so these cookies are better, because you don’t have the chewy, slightly burnt edges of a brownie. The cookies also take about half the time (about 12-14 minutes) than brownies usually take to bake, which is a plus, because I am impatient; once I smell the chocolate and sugar melting together in the oven, I want to just dive right in eat the partially baked brownie batter. These cookies are good warm or room temperature, if you can wait long enough to let them cool before eating them all. Next time I might add peanut butter chips, or butterscotch chips, rather than chocolate chips. Maybe even try adding some banana bits. I just want to let everyone (if there really is anyone out there reading this) know that I may not be new to the blogging world, per se, because I did blog while I was in college and high school, (those posts have now been deleted)but not like this. So, I appreciate any comments about the blog in general. What would make it more interesting? more appealing? anything that needs improving? I promise to have the first real posts up soon. Right now, I am just enjoying the weekend, and I hope you are, too. Obviously, I have not blogged in a long time. However, I have been inspired to go back to blogging. I want to have a dessert blog, similar to the ones I am inspired by. No more of the mundane posts about my life, what I have been doing, and with whom. At least nothing like the past. Nothing about the prom (because I am almost 22, and have been out of high school for a few years now) and nothing about work (not only because I am unemployed, but also because I feel like this should be separate from all of that). I want to post about my dessert adventures. Perhaps about a dessert I really liked at a restaurant or bakery I enjoyed. Maybe about my attempts to make something creative in my own kitchen. I hope to share with you what my life is like, and perhaps inspire other people to start blogging as well. 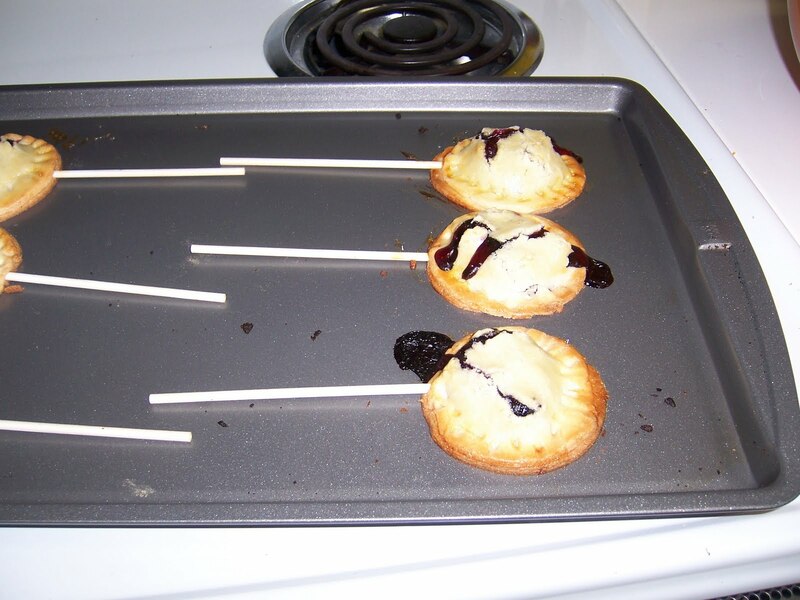 Today, I was inspired by the blog, Bakerella, because I want to try the pie pops she blogged about. I am also inspired by the movie Julie and Julia, about a blogger (Julie Powell)who attempts to cook all of the recipes in Julia Child’s book. I am also inspired by the world around me, including my friends and family. They care so much about me, and I want to have something exciting to share with them (along with anyone else who happens to be reading this).